Architect’s Rendering of HSBC Place. Photo provided by AIMCo. 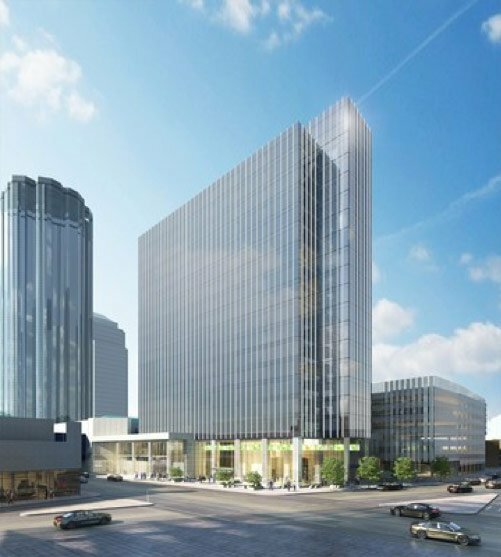 Edmonton, Alberta – July 26, 2018 – Alberta Investment Management Corporation (“AIMCo”) announced today its plans for the complete redevelopment of HSBC Bank Place to become Edmonton’s newest “AA” class office building. Acquired on behalf of its clients in February 2017, HSBC Bank Place is located in the center of Edmonton’s downtown business core, adjacent to the vibrant Ice District, and within close proximity to the city’s most sought out lifestyle and business destinations. HSBC Bank Place, a 317,000 sq. 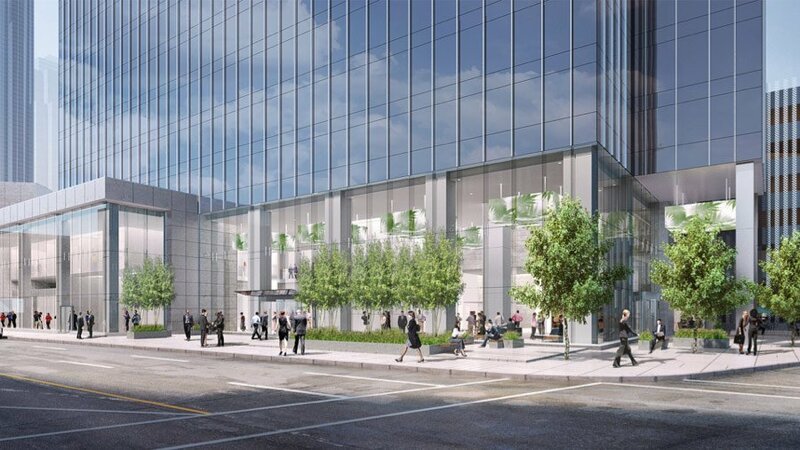 ft. office tower in Edmonton’s financial district, is undergoing a complete exterior and interior redevelopment. Once concluded, the new building will boast a triple glazed curtain wall system, floor to ceiling view glass in the office area, new mechanical and electrical systems, and a revitalized 2-storey lobby, transforming the building into a distinctive and best in class “AA” office building and bringing new life to the corner of 103rd Avenue and 101st Street. The redevelopment is targeting LEED Gold Certification, WELL Gold Certification, and to become the first office building in Western Canada to be Wired Certified. Buoyed by an improving employment landscape and recovering economy, the Edmonton office market is beginning to see heightened activity. In Q2 2018, the market saw over 261,000 sq. ft. of positive net absorption, the commercial real estate industry’s measure of tenant demand. This represents the best quarter for tenant activity in over 20 years, leading to a 300-basis point year-over-year decline in vacancy to 16.9%. “Tenants in the Edmonton office market have a growing appetite for quality office product, as evident by the successful lease-up of recent new build trophy spaces. Tenants across all industry sectors are beginning to leverage real estate to attract and retain the best talent. Office space is being utilized as a tool to frame and cultivate culture for a growing segment of the workforce that expects more from its employer. This in turn, has created a market wherein tenants are expecting more from their landlords,” commented David Young, Executive Vice President and Managing Director of CBRE Edmonton. Preliminary work commenced in June, with the full redevelopment expected to conclude by the end of 2019. AIMCo is one of Canada’s largest and most diversified institutional investment managers with more than CAD 103 billionof assets under management, as at December 31, 2017. AIMCo was established on January 1, 2008 with a mandate to provide superior long-term investment results for its clients. AIMCo operates at arms-length from the Government of Alberta and invests globally on behalf of 32 pension, endowment and government funds in the Province of Alberta. For more information please visit www.aimco.alberta.ca. AIMCo’s $13.6 billion real estate portfolio includes long term, direct investments in quality office, retail, industrial and multi-unit residential properties located in Canada’s major cities, and non-Canadian properties in markets with long term growth characteristics and supported by strong local management teams. Epic Investment Services is an employee-owned real estate advisory, asset and property management and mortgage services company. Operating from offices in Toronto, Montreal, Ottawa, Calgary, Edmonton and Vancouver, Epic has over $14 billion in assets under management. Our national portfolio includes office, retail, industrial and multi-family properties and it comprises over 24 million square feet of leasable commercial space. For more information please visit: www.epicinvestmentservices.com. DIALOG’s multidisciplinary team includes architects, urban planners, interior designers, structural, mechanical and electrical engineers, and landscape architects. We practice across Canada and the US from studios in San Francisco, Vancouver, Calgary, Edmonton, and Toronto. Our work includes designing for urban vibrancy, health and wellness, transportation, education, arts and culture, residential, retail, and commercial, as well as mixed-use solutions which incorporate an increasing number of these. About PCL Construction Management Inc.
PCL is a leading Edmonton-based construction company conducting business throughout North America, Australia, and the Caribbean. The employee-owned PCL family of companies is the largest contracting organization in Canada and one of the largest in North America, with diverse operations in civil infrastructure, heavy industrial, and buildings markets. PCL operates in 31 major centers with an annual construction volume over $8 billion and is involved in more than 700 projects at any given time. PCL’s Edmonton Buildings District delivers buildings and civil infrastructure projects ranging in value from $10,000 to more than $1 billion. Visit PCL.com to learn more. CBRE Group, Inc. (NYSE: CBRE), a Fortune 500 and S&P 500 company headquartered in Los Angeles, is the world’s largest commercial real estate services and investment firm (based on 2017 revenue). The company has more than 80,000 employees (excluding affiliates), and serves real estate investors and occupiers through approximately 450 offices (excluding affiliates) worldwide. CBRE offers a broad range of integrated services, including facilities, transaction and project management; property management; investment management; appraisal and valuation; property leasing; strategic consulting; property sales; mortgage services and development services. Please visit our website at www.cbre.com. In Canada, CBRE Limited employs 2,200 people in 22 locations from coast to coast. Please visit our website at www.cbre.ca. HSBC Bank Place, located at 10250 101 St NW in Edmonton, Alberta, is an 18 storey office tower located in the heart of Edmonton’s Financial District. HSBC Bank Place offers a variety of amenities including a 7 storey parkade with 24/7 security and heated underground parking. It is connected to the City Centre Mall via the main and second floor pedway. HSBC Bank Place’s central location provides tenants with excellent access to public transit all within a one block radius.